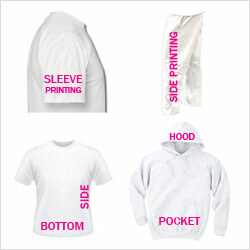 The T Shirt Man has an integral part of our business is making the process as simplle as possible for our customers, We aim to be the first choice for t shirt printing. We offer our customers total control over design and production of your products, we also provide our customers with email communication every step of the way. You will receive an artwork proof before production, approve your proof, we will start production, and send tracking numbers with your guaranteed delivery date! No matter what format your design gets to us in, we should be able to work with them. While we accepts many formats, such as .JPG, .GIF, .BMP, .TIFF, .PDF, the software may need to use a placeholder image for formats that cannot be translated into an image. 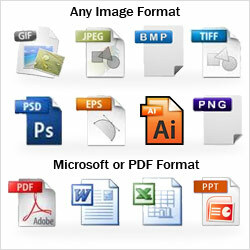 File formats such as .AI, .EPS, .DOC, .XLS, .PPT, and .PSD are given placeholders. Pixelation is every designer’s worst fear. Taking the time to create what you feel is a masterpiece, only to have it look boxy, choppy, and sloppy, is a heartbreaking experience. But fear not! 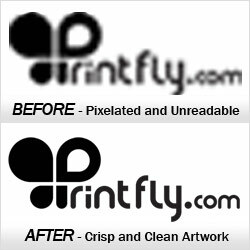 Our all-star design team will be happy to clean up your pixelation issues by increasing the size of your image and redrawing your outlines so that your design prints perfectly. 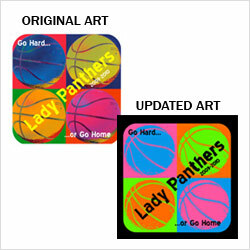 We can even change the color of your logo or add an outline. Simply let us know what you’re looking for and we’ll take care of the rest. Prices start at £10.00 for basic artwork fixing however the more complex artwork will require more time and cost slightly more. When uploading your own design, sometimes a box will appear behind your artwork. 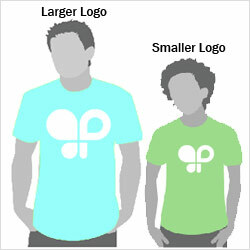 In some cases, it is completely different than the shirt color. Not to worry — This is an easy fix! After placing your order, our designers will remove that background and show you a finished design layout without that extra coloration. 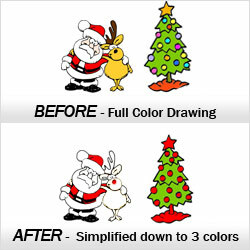 If you need to make changes to your uploaded design, we can help! When you’re ready to check out, simply leave us a note detailing the changes you’d like to see, and we’ll make the revisions when your order is placed. You’ll be able to review the finished layout when we send you the final design proofs for your approval. If you are ordering both youth and adult apparel, don’t worry! We always make sure that your print will fit on all of the apparel in your order, even if that means making two different print sizes for you! We recommend paying particular attention to the contrast between the shirt color and ink colors you select in order to make sure you will be satisfied with the final results. For example, if you think white ink looks great on a forest green t-shirt, go for it. 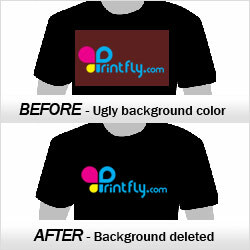 Or if you think red ink looks great on a black t-shirt, no problem. Everyone has unique tastes, but if we feel that you have chosen an ink color that will not be visible on your shirts — we’ll have your back! Should this occur, we will notify you of our concerns by phone or email. If you would like our recommendations before placing your order. 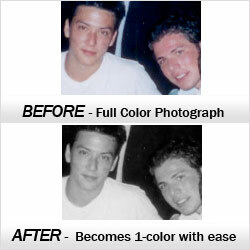 We receive plenty of orders from customers looking to print full color images on a budget. While it’s not always the most inexpensive process, we offer plenty of alternatives to help your plan come to fruition. For instance, if you’re planning a birthday party on a budget and want some commemorative t-shirts for the occasion, our designers can take your image, convert it to black and white, and then print it on whatever color apparel you’d like, thereby cutting overall costs. When it comes to art, anything is possible! 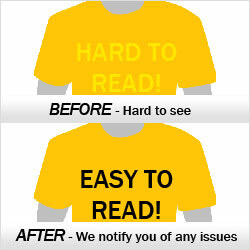 Simply let us know what you’re looking for and we’ll make any changes you need. 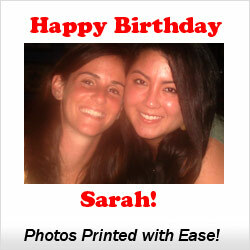 We print full color photographs and artwork every single day. 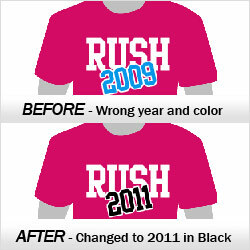 Better known as CMYK, it is routine at Rush Order Tees. Magazines often print full color images on white paper using very small dots of color, and we reproduce full color images using the same method. We blend just four ink colors to create millions of unique color combinations to satisfy any visual palette! 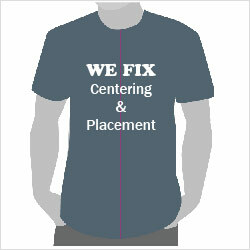 This is considered the final frontier in screen printing, and we’ve managed to make it look easy! Because of the extra planning and materials needed to print full color images on dark colored items, Simulated Process printing is considered much more difficult than CMYK printing. 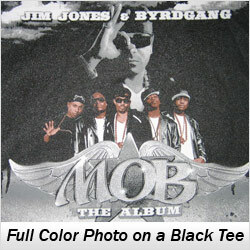 However, we have mastered the art, and are capable of printing designs that could otherwise require as many as 18 colors. When it comes to artwork, everyone has their own communication preference. Many customers use email. 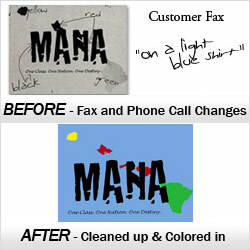 However, you can also fax us the design or simply give us a call to let us know what kind of artwork you need.